Using radio-telemetry collars, like we do on this project, requires that we periodically recapture each puma to replace the batteries on the collar. Currently the batteries on our collars need to be replaced about every 2 years, although the life of the battery continues to get longer as technology improves. The batteries on tracking collars run out in stages. First the GPS unit stops working, and we no longer get location data, then lastly the radio telemetry beacon stops. We’d attempted to recapture 38F using dogs a couple of times last spring, however on both occasions she climbed too high in the tree for us to think she’d be safe if the tranquilizing drugs took effect before she climbed down. This is a rare event, but one that we plan for in case it happens. As a result, despite our best efforts to recapture 38F, the batteries began to run out on the collar without our being able to replace them. Houndsman Cliff Wylie with dogs (from left) Cleo, Pearl, and Boomer. Last week, we were fortunate because 38F came to us. We had left a couple of deer in the forest to unthaw before placing them as bait. When we went back to retrieve them the day after, one of them had been dragged away and buried. The faint radio-tracking signal from 38F’s collar told us she was close by and the likely culprit of this petty theft. We set a trap, and with a team of volunteers and undergraduates monitoring the trap, we caught 38F shortly after sunset. We are not likely to see her in person for another two years until it is time to replace the batteries on her collar again. 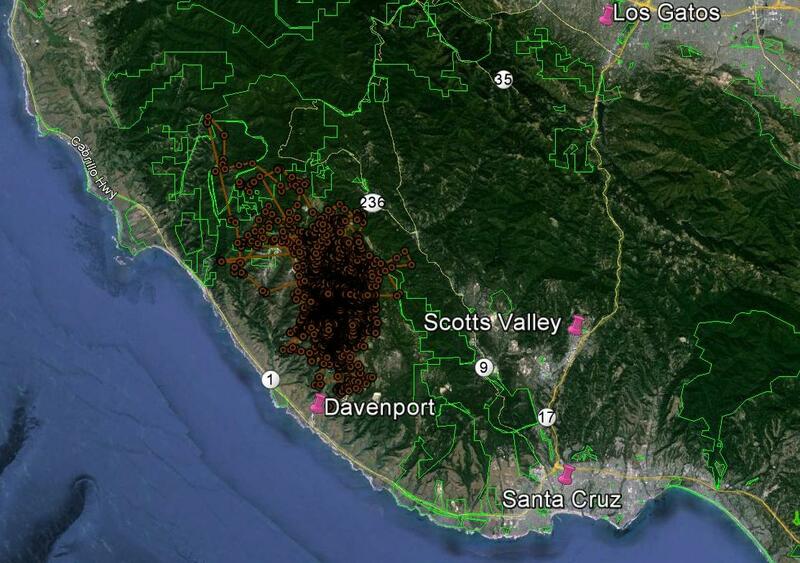 All of the gps locations for puma 38F since May 2013. Green lines are boundaries of public parklands. 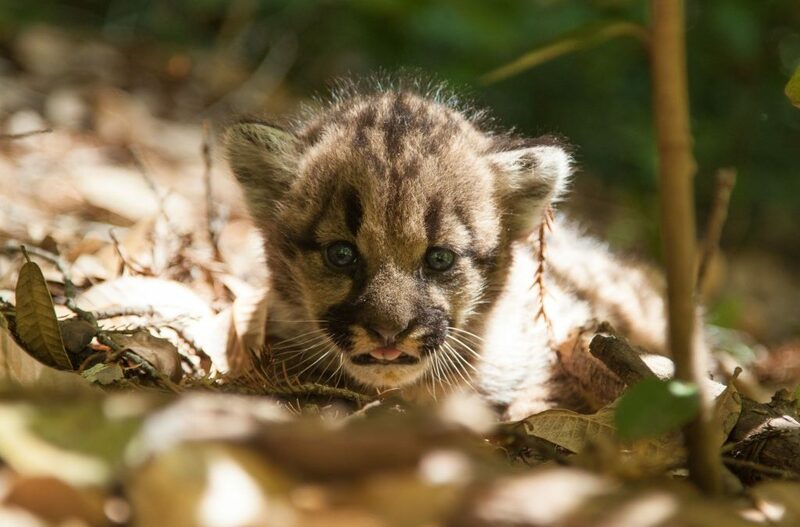 The Bay Area is a great place to research relationships between people and pumas. The region is blessed with progressive land planning that has set aside vast open space areas for recreation and privately-owned areas that are managed for timber and wildlife habitat. Between and surrounding them are places where people live: small communities, major urban edges, sparse or sprawling dwellings. Our research shows that pumas wind their way through all of them. 38F lives almost entirely in the quiet open space of the San Vincente Redwoods and data about her life provides a valuable comparison to the lives of pumas that have more contact with people. Through work like this, we will continue to learn more about this landscape we inhabit from the puma’s view, and how to make choices that allow it to support people and pumas into the future.